Perched on the north side of the Dallas and Fort Worth Area, Denton is its own kind of place. With a youthful vibe, an independent streak a mile wide, two major universities, and a thriving arts and music scene, it's a great place to visit any time of the year. Yet spring here is a treat for all the senses. Soak up the sunshine while cruising North Texas Horse Country and treating yourself to delicious craft beer and all of the town's culinary delights. As you can see, there are many reasons you should visit Denton this spring. Read on to find out more. 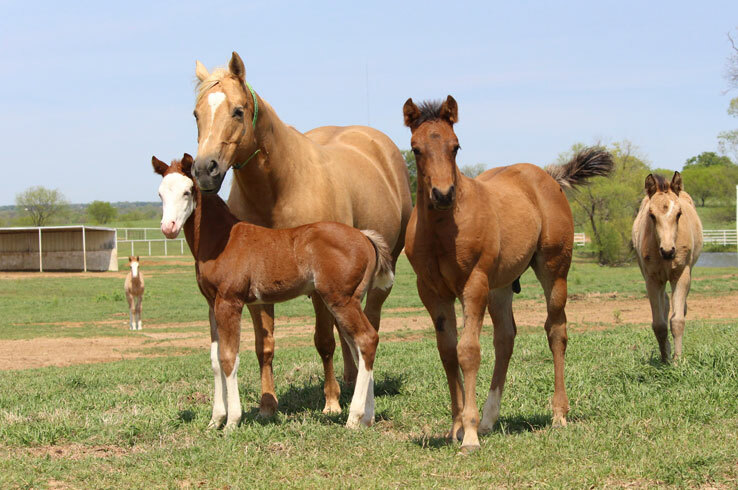 As the old saying goes, “Good things come in small packages.” That’s especially true in the spring here in North Texas Horse Country, where you’ll find oh-so-adorable baby horses (also known as foals, for you city folk) galloping at one of many pastoral farms. Assuming you, like most of us, can’t get enough of cute animals, you won’t want to miss the chance to take a guided tour of Horse Country that takes you behind the scenes at two premier horse farms near Denton. If you’re lucky, you may even get an Instagram-worthy selfie with a foal. What else could you ask for? Horse Country tours are only offered a few times per year, with this spring being on March 3, April 7, and May 5. Even if you don’t go on a guided tour, you can see some of the more than 300 horse farms in the area on one of these driving tours, or go horseback riding at one of these ranches. Whether you’re an equestrian enthusiast or you want to see something you won’t find anywhere else, you’ll be right where you belong if you come to Denton. What’s better than the soothing sounds of jazz or the tap-your-toes rhythms of rock and roll played by some of the best performers around? Listening to them while enjoying the fresh and cool air of spring at one of several outdoor venues in Denton. Order up a pizza and a few beers and find a seat at a picnic table at Backyard on Bell, a spacious spot where you can also find tasty bites from local food trucks. 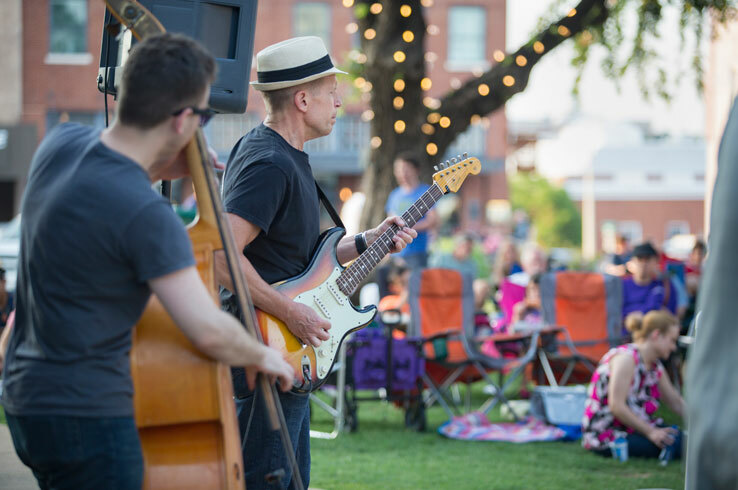 On every Thursday night from late April through late June, you can listen to some tunes on the lawn of the Denton County Courthouse-on-the-Square Museum lawn during Denton Main Street Association’s free Twilight Tunes concert series. Denton has a full ensemble of indoor venues you’ve got to check out, as well. Sip a wine and savor some jazz at Steve’s Wine Bar, or pair acoustic tunes with a delicious latte at Zera Coffee Company. Bonus: they’re a non-profit coffee shop staffed by volunteers that supports a local charity. From mouthwatering handcrafted burgers to delicious Latin street food and savory steaks, Denton’s dining scene is as diverse and independent as the city itself. Better yet, you can enjoy much of the city’s culinary offerings outdoors, as many of its restaurants have outdoor seating. Take in the view of the historic Denton County Courthouse while you’re noshing on a creative and flavorful burger on the second-floor patio of LSA Burger Co.
For upscale comfort food, head to Hannah’s Off the Square. Order a glass of wine and something hearty, like lamb meatloaf burger or cedar planked salmon, and relax on the puppy-friendly patio. You’ll also find palate-pleasing fare at the Greenhouse Restaurant, which greets you with the aromas of cooked meats from its open-fire grill. Serving both American and Tex-Mex fare, Greenhouse has a bit of something for everyone. 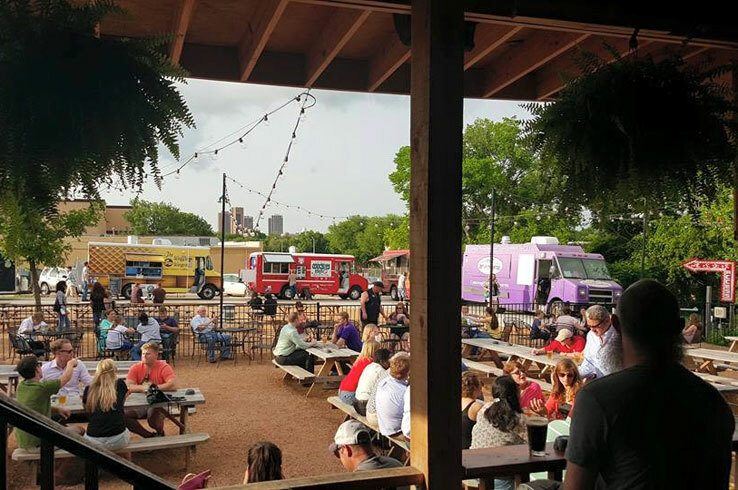 These are just three of many examples of outdoor dining spots in Denton. Find more here. The delightful weather of spring serves up the perfect conditions for one of the best things you can ever do: drink beer. Fortunately, Denton is full of places where you can pair amazing craft beer with warm sunshine, mapping out your very own pub crawl in the process. Start at Oak Street Draft House, where you can take your pick from more than 70 craft beers on tap and find a spot in the huge back patio (complete with a ping pong table). 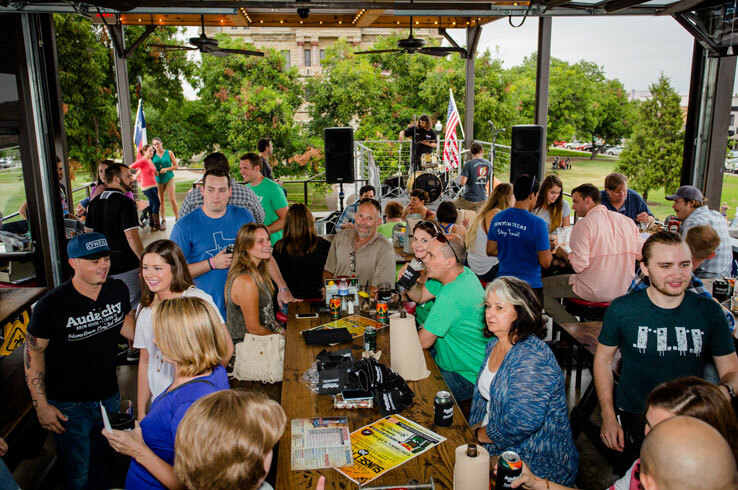 Then trek on over to Denton County Brewing Co. for locally brewed beer and some fresh air. As afternoon turns to evening, stop in at Dan’s Silverleaf for a beer or a cocktail as you listen to a live music performance from the patio outside. There are even more places to enjoy a drink outdoors in the downtown area, meaning that no two pub crawls are ever the same. 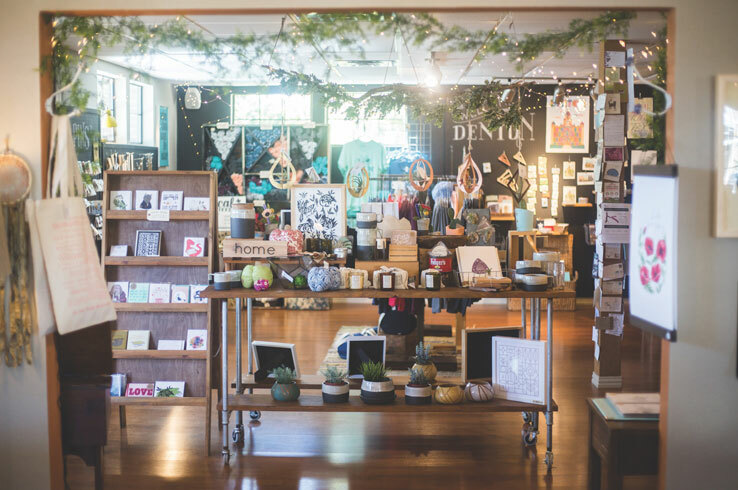 Beyond its bars, coffee shops, and restaurants, downtown Denton is full of unexpected finds you’ll want to browse for. Peruse the fun and quirky collection of jewelry, handmade crafts, Denton-themed t-shirts, and one-of-a-kind pieces of art at Sleeping Lizzards, located a few blocks north of the downtown square. Then stop by the DIME Store to see all the handcrafted wares made by more than 50 local artisans, including everything from plant-based skin care products to metal jewelry and whimsical stationary. For high-end fashion, step on over to J.T. Clothiers, a premium retailer of men’s and women’s apparel that has been a Denton institution for more than 40 years. Want a taste of North Texas? Visit the Denton Community Market, where you shop locally sourced fruits and vegetables, honey, meats, eggs, and other goodies. The Denton Community Market’s 2018 opening day is April 7. Make sure mark your calendar so you don’t miss out. Be one of the first to see cutting edge documentaries from all over the world and celebrate two things Denton is famous for: art and jazz. These experiences await at the two major events in spring, the Thin Line Fest (April 18 – 22) and the Denton Art & Jazz Festival (April 27 – 29). The Thin Line Fest is a documentary film, music, and international photography festival rolled up into one event, serving up an experience for (almost) all of your senses. 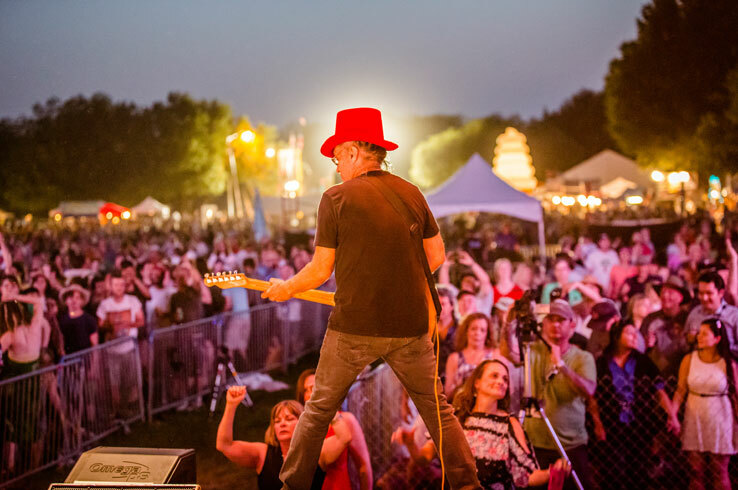 Later in the month, the Denton Art & Jazz Festival features seven stages of continuous music, art, crafts, food, and games set in the scenic Quakertown Park. Both events offer free general admission, so you don’t have an excuse to not come experience two of the coolest events in the DFW area. With its abundance of sculptors, painters, and galleries, it’s no stretch to say Denton is an arts town. 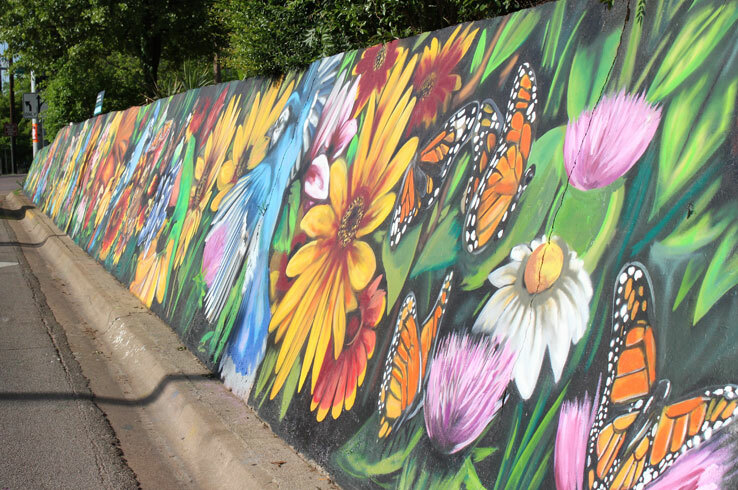 Spring is the perfect time to experience it for yourself, starting with all the colorful murals throughout the downtown area. Hop in your car, roll down the windows, and cruise through town, stopping at any that catch your eye for a few photos or the obligatory vacation selfie. Use this guide so you don’t miss anything while you’re here. To see art on a smaller, but no less impressive, scale, stop by A Creative Art Studio and the Greater Denton Arts Council. A Creative Art Studio boasts a collection of fine art and handmade crafts created by artists from in and around Denton that you can take home with you. At the Greater Denton Arts Council, you’ll see rotating exhibits with works by local and visiting artists. No matter where you go or what you do, you'll find there's an endless amount of fascinating art to admire. Already planning your next getaway to Denton? Visit Discover Denton to learn more about what this North Texas town has to offer and start planning your trip today.